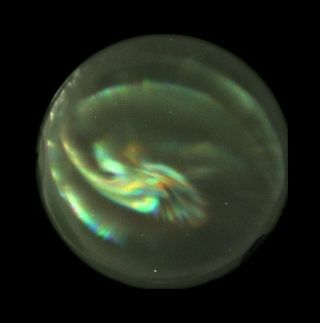 The aurora as seen as a color composite image from the NORUSCA II camera. Three bands were combined to make the image. Each band was assigned a different color -- red, green, and blue -- to enhance the features of the aurora for analysis. It's quite a treat to get a look at the shimmering, mysterious northern (or southern) lights. But you've probably never seen them like this. Norwegian researchers have built a new camera that's provided a more detailed glimpse of dazzling auroras than ever before, as it is capable of rapidly capturing and analyzing multiple wavelengths, or colors, of light at the same time. Current cameras lack the ability to capture and measure multiple slivers of the visible spectrum. That means if researchers want to study auroras by looking at specific bands of light, they have to use a series of filters to block out the colors they don't want, according to a release from the Optical Society of America, the publisher of the journal Optics Express, where details of the camera were published today (Nov. 30). The red arrow points to the unidentified low-intensity wave pattern, which the researchers suspect is an auroral-generated wave interaction with airglow. For contrast, the blue arrow points to the faint emission of the Milky Way. Auroras are created when charged particles from the sun penetrate Earth's magnetic field and react with molecules in the air, lighting up skies in the Northern and Southern hemispheres. These beautiful displays in the night sky reveal important information about the Earth's upper atmosphere and the way our planet responds to powerful solar storms. By allowing researchers to quickly analyze different bands of light in auroras, the camera could pave the way to better understand the phenomenon and what exactly goes on in the atmosphere during solar storms. On Jan. 24, 2012, when researchers were first testing the camera, they witnessed a major solar flare that released a burst of high-energy particles known as a coronal mass ejection (CME). The CME eventually hit Earth's magnetic field, creating magnificent auroras and a chance to test the new device. The camera revealed something unexpected in the event: a faint wave pattern of unknown origin in the lower atmosphere. The wave pattern resembles "airglow" — the natural emission of light by Earth's atmosphere. Airglow can be produced by a variety of known sources, including cosmic rays striking the upper atmosphere and chemical reactions. But its appearance at the same time as the aurora suggests that it may also be caused by a previously unrecognized source. This shows an aurora appearing in the night sky at the Kjell Henriksen Observatory in Svalbard, Norway. Taken November 2010. "This would be an entirely new phenomenon and if confirmed, would be the first time airglow has been associated with auroras," said Fred Sigernes, a researcher at Norway's University Centre in Svalbard who worked on the camera, in the statement. Follow OurAmazingPlanet on Twitter @OAPlanet. We're also on Facebook and Google+.